Scientists and historians have since solved the mystery. 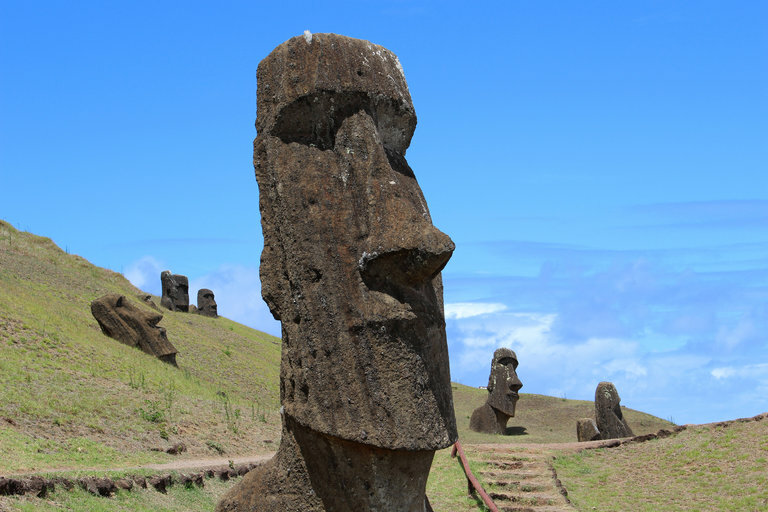 The statues, or moai, were built over hundreds of years by Easter Islanders themselves — a formerly advanced Polynesian society that was prosperous enough to make ever bigger and more ornate statues. One, still being carved in the quarry when it was abandoned in the 1600s, is 70 feet tall and weighs 270 tons. What destroyed this civilization was apparently deforestation in the 1500s and 1600s. The islanders cut down trees for cremation, for firewood, for canoes, for homes and perhaps for devices to move the statues. Rats and beetles may also have contributed to the deforestation. Once the trees were gone, there were no more fruit and nuts, and it became impossible to build large canoes to hunt porpoises and to fish for tuna. Hungry villagers also ate up the land birds, such as herons, parrots and owls, until they were gone, too. Deforestation caused erosion that led crops to fail, and this advanced society disintegrated into civil war. Without oceangoing canoes, it was impossible for inhabitants to flee to other islands, the way their ancestors had arrived centuries before. Groups began attacking one another and destroying one another’s statues, with oral histories even recounting cannibalism. This entry was posted in Environment, Nicholas Kristof, Population Growth Issues and tagged A Parable of Self-Destruction - by Nicholas Kristof - NYT. Bookmark the permalink.